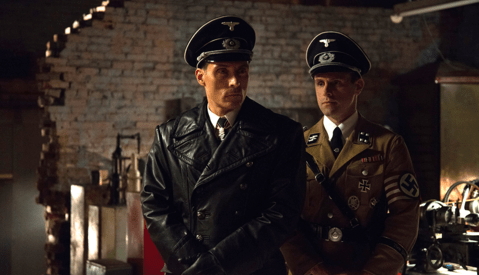 This article is a twist on the more common behind the scenes post. Instead of writing about the thought process of the shot in retrospect, I am starting this article several days before the full moon, to showcase my process and mindset when planning for a once in a lifetime shot of the Supermoon. 3:30PM - At our current location here in Cape Charles, VA, we are essentially on a peninsula. 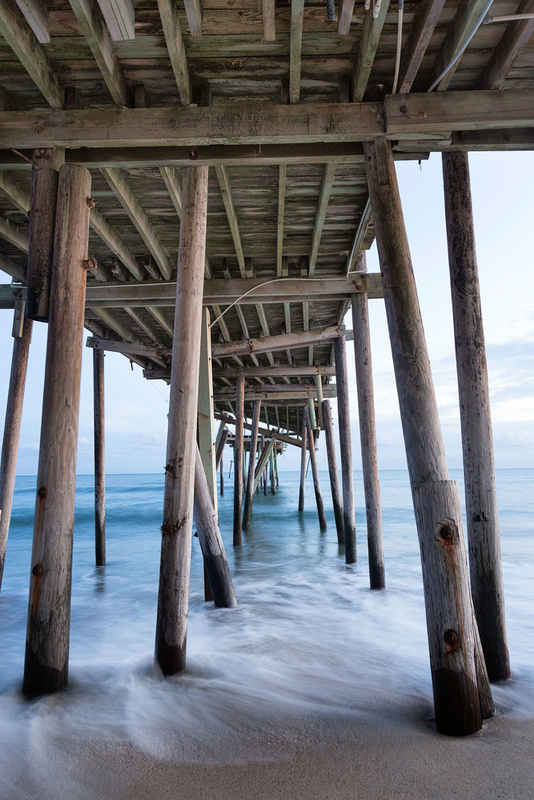 I have identified three potential locations to shoot at; the Chesapeake Bay Bridge Tunnel, which runs north to south and is 30 minutes away, Kiptopeke State Park which is about 10 minutes away, and features 9 sunken ships close to shore, and an infamous fishing pier located at Nag’s Head North Carolina, about two hours away. 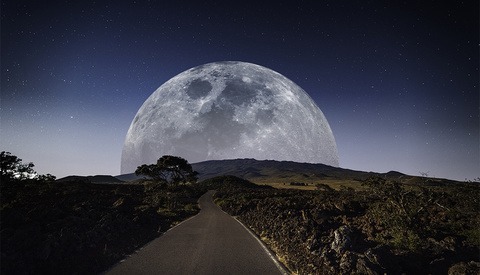 My first thoughts are that the moon will RISE off the East coast, so I should focus my efforts on locations that are arranged from that vantage. A quick check of The Photographer’s Ephemeris, an excellent and FREE online resource for photography planning, indicates that on November 13th, one day prior to being full, the moon will rise at approximately 4:41 PM­ vs the sunset which will occur at 4:56 PM. This means the moon will be coming over the horizon before the sun sets hopefully leaving the foreground and sky with enough ambient light for a colorful, well balanced exposure. 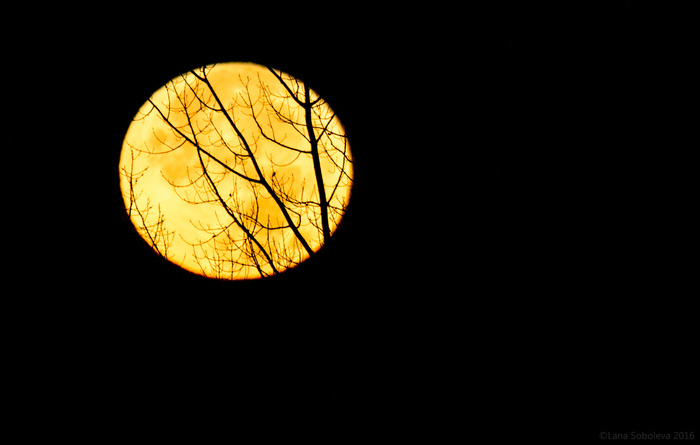 Conversely, on the day of the full moon (November 14th), it will rise at 5:29 PM as opposed to the sun setting at 4:55PM, almost half an hour later which will leave the foreground significantly darker. Assuming we want a decent exposure for the foreground I intend to try and shoot the day before with the actual day as a backup. I will also plan to arrive at least one hour before to scout the area, establish my composition, and get a few predusk shots in case an exposure blend is needed. 7:24PM – After driving through Kiptopeke State Park to scout the location, I determined that although the sunken ships are pretty cool, they simply do not make an interesting enough composition to pair with this particular event. The ships are sunken in a straight line parallel to the shore and are aligned on the West coast meaning I would need to shoot the moon setting in the very early morning as opposed to before sunset. Not that I am opposed to mornings, but in my mind the composition simply isn’t strong enough. We are camping at the North shore of the Chesapeake Bridge tonight in order to photograph its sunrise tomorrow. 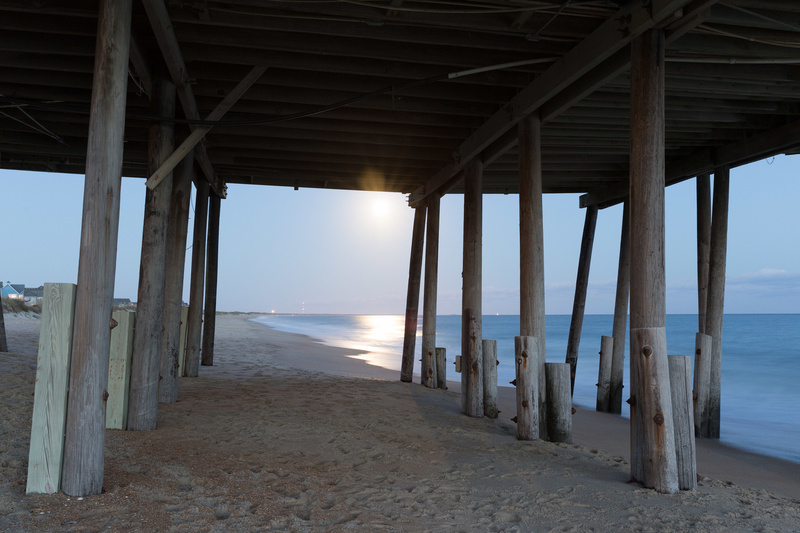 The $15/way toll is too prohibitive for my budget, and because I will need to drive through at least twice to scout compositions, I have decided on the pier in Nag’s Head for my shot tomorrow evening. 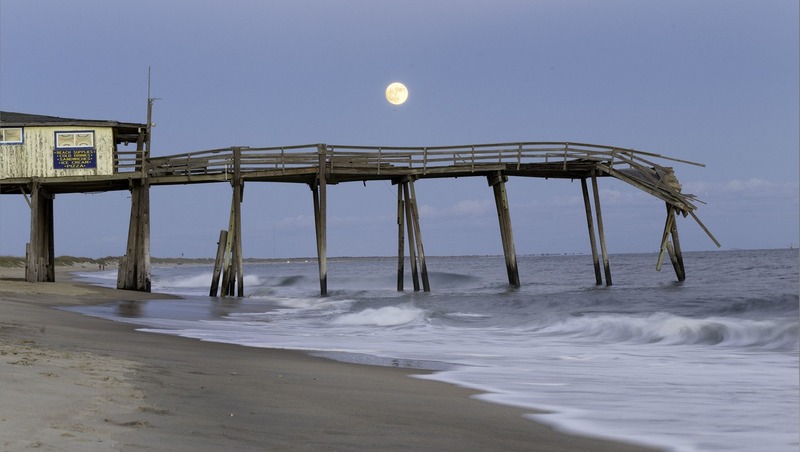 According to Ephemeris, the moon will rise tomorrow virtually perpendicular to the shoreline meaning I should be able to use the pier as a leading line with the moon coming up directly over the middle. My biggest concern with this concept is a crowd of people being present on the pier which can only be combated by using a very long exposure via ND filter. 2:30PM – After a quick two hour drive, we arrived at Nag’s Head in the Outer Banks region. Overnight I came across a photographer by the name of Mark Van Dyke whose images of this area on Flickr were incredible. On a whim, I emailed him and being a fellow photographer he was kind enough to respond back early this morning with several suggestions on where to shoot in the area. 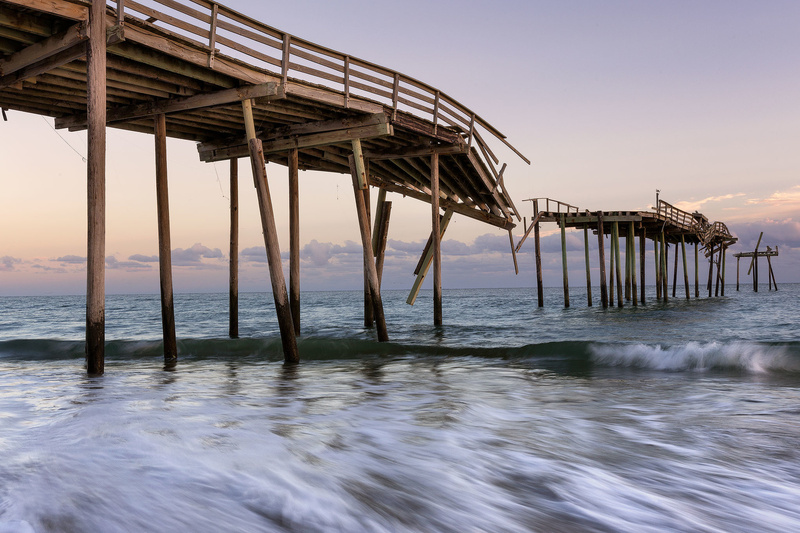 Among them was Frisco Pier located at the very south end of the island chain which was partially destroyed in 2015 by Hurricane Joaquin, leaving a tangled mess of pilings and dock. A quick search on Google showed what appeared to be a very interesting subject for a foreground, however it was another hour and a half drive along, with several articles mentioning it was slated to be demolished in early fall. After several phone calls and inquiries with locals, we determined it was fairly likely the pier was still present so we made the slow drive down. 5:45PM – Unable to fly drone due to automatic flight restrictions in the area which have to be overridden. 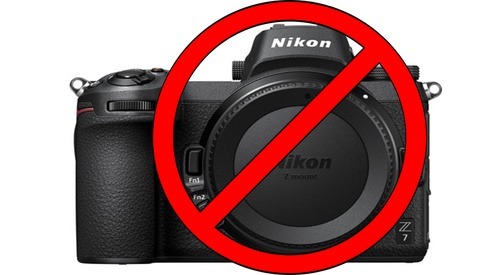 There goes my B-Roll. Oh well, the sunset is incredible and bathing the right side of the dock in beautiful light. Frantically, I set my tripod up using the right side of the dock as a leading line to the ocean and proceed to splay my tripod out in its lowest stance to get close to the incoming tide and capture the movement. It’s going to get wet and sandy without doubt. About this time several other photographers start showing up but they are not interesting the same composition I am. Wonder why? 5:00PM – Quickly it makes sense. The moon is HUGE as it breaks the clouded horizon but of course, it is rising over the left coast of the pier and I am still shooting towards the ocean. Time to readjust. I switch to my 100MM lens which is the longest lens I currently own and step 100 yards away from the right side of the dock to capture the moon rising through the pilings. Arrive earlier-this goes without saying. Bring waterproof shoes and a jacket. I had neither and was cold as well as barefoot throughout the shoot which just looked stupid and at a disadvantage. Consider location more carefully and avoid making last minute decisions unless the risk is worth it. While I sort of enjoy the thrill of playing it off the cuff, in hindsight I should have researched the exact location of the pier beforehand instead of just assuming it was only an hour away and facing eastward. It turned out to be almost an hour and 45 minutess away, and facing southeast which was a HUGE difference in my plan leaving me scrambling for time and compositions. Consider renting a longer lens. I knew going into this that my 100mm max focal length would be insufficient for shooting the moon but it was all I had at the time. If I had planned for this well in advance, I would have bought, or rented, something longer. Shoot more video! I really wanted to make a great clip of this setup behind the scenes but I didn’t have a windscreen on my lav, my levels weren’t set properly for my audio, and I didn’t have a light for my face. Epic fail. Did this shoot go well? I’d say not. But that happens and at the very least it was an awesome experience. I will be heading back out tomorrow for a redo and will post those shots on my Fstoppers profile once they are edited. Here are some quick edits of the takeaways from this evening. Pleasure to meet you as well, Mark! Thanks for the shout out and the great words. Upon arriving at the beach yesterday evening, Tommy White and I were a both bit disappointed that the moon angle wasn't a bit better at Frisco Pier (we visited the evening before and it was much better). However, what a great location on such a beautiful stretch of coastline! We managed to play with the strong light cast by the large moon throughout the evening to different affect. 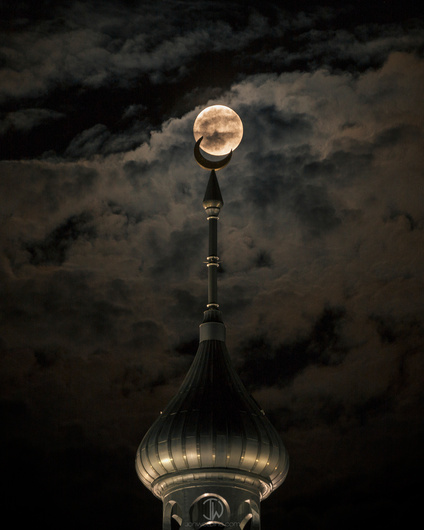 Let's hope that this evening's full moon is not lost to rainy weather or overcast skies! Thanks again, Mark and my bests to you and your wife as you fulfill your dreams and travel the road. Thx for commenting Mark! We may get another shot tonight eh?? Chief, I am confused about some of your locations. I am very familiar with the area as your grandmother and I lived in Norfolk for 3 years. 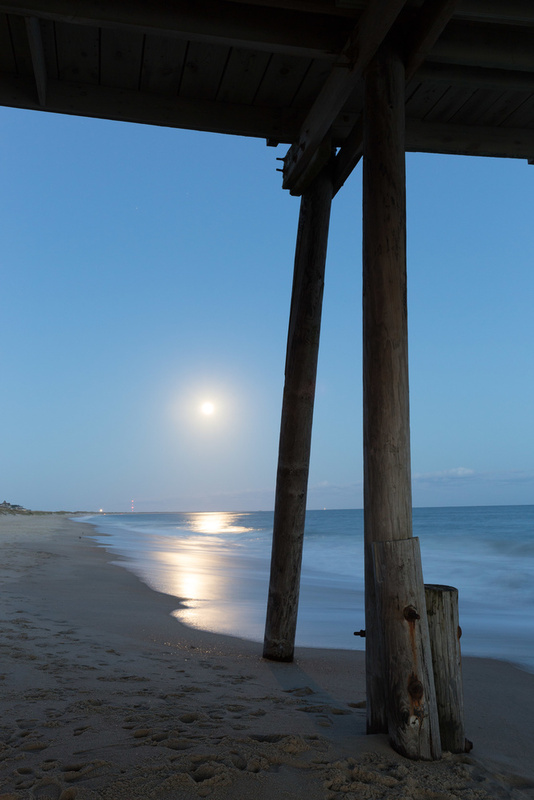 You should have tried Cape Henry for the moon shot, if you could get access. Further, while you're in the asrea check out the Dismal Swamp, if you are not past it yet. Me and a buddy used to get misseltoe there at Cristmas Time and it really is a swamp. Anyway good article and I'll be on the lookout for more. I had slightly more luck last night... the cloud cover was moving fast and I got literally one good shot. Thanks... wish I could say I spent a lot of time planning, but really I just grabbed my backpack and drove 10 minutes. I do appreciate Mark Bower's tactical approach and follow-thru even though he didn't get what he had hoped for. I'd say that 50% of the time, I'm so upset at the weather conditions (too much/little rain/clouds/sun) that I don't even bother snapping a single frame. 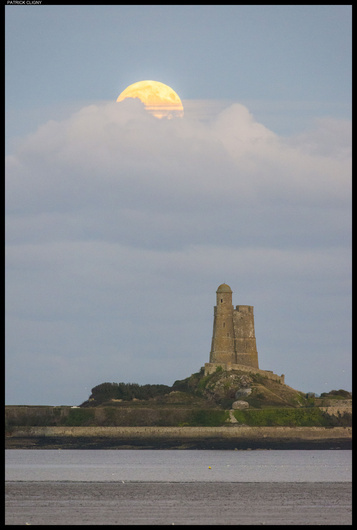 This is a picture taken on sunday 11/13 to see the moonrise over the Vauban tower in Saint-Vast-la-Hougue Normandy, France. Vauban towers were build at the time of Louis XIV to protect the french navy. On sunday, sunset and moonrise were about on the same time, just enough light to take this picture with Nikon AF-S 300mm/2.8 plus TC17 on D800e. I had great plans but it was raining cats and dogs. No moon in sight. Thanks Mark. I'm lens greedy so I own a wide range. If you want to go more telephoto reasonably cheap check out Canon 70-300mm f/4-5.6 IS USM, I see it refurbed on Canon site fairly frequently. It's a really decent lens, maybe not superfast for wildlie, but definitely good enough for compressed landscapes.